The example of two boys from elite families of Duala, Cameroon living with a petty bourgeois German family discusses child circulation practices of the Atlantic contact zone in relation to notions of "family" and homemaking. On the level of colonial control the ambivalent practices of state control through the male custodian and the agency of the African father by means of financial and social interaction are highlighted. On the affective level an array of relations between extended families points to bonds not governed by the logic of "race" and coloniality. Although in the end the German colonial authorities forcefully restricted the ambitions of Tube Meetom and Rudolf Duala Manga Bell, by exiling one and executing the other, their life stories already advanced African independence movements of the 1930s. 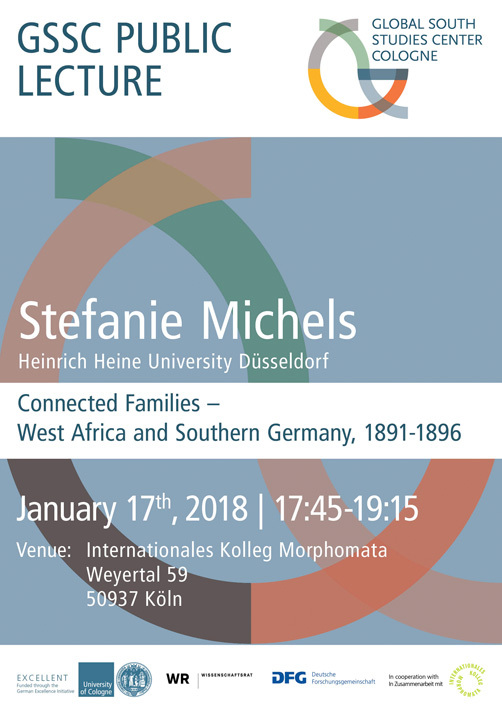 Stefanie Michels is a Historian with a focus on German colonial and African History. She teaches at the University of Düsseldorf, Germany and has published on the construction and contestation of colonial power in the Cross River Area of Cameroon during the German colonial period and on the visual representations of German colonial soldiers. The article is part of her ongoing research on the cosmopolitan mobility of actors from Duala, Cameroon.